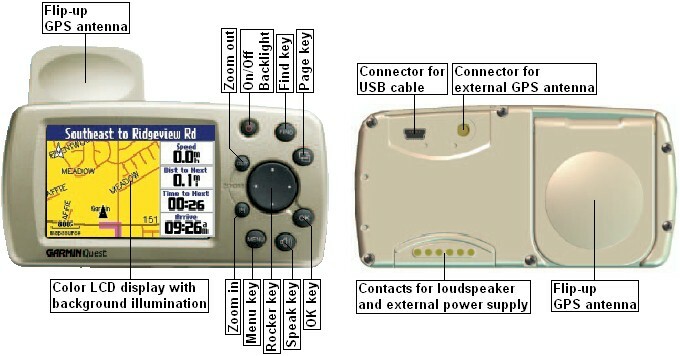 GPS receiver with auto-routing, voice guidance, color display, integrated world and Europe/Africa map plus USB interface. Hand held device but also well suited for all kinds of vehicles. The GARMIN Quest provides automatic route calculation, visual and voice guidance, is easy to use via local controls, has an easy to read color display, an extremely sensitive antenna, an integrated world map (overview) plus a base map of Europe, Africa and the near East. 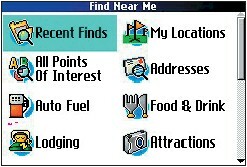 In addition, the GARMIN Quest has 243 MB of built-in memory to store even more detailed information, such as local roads, restaurants and points of interest. 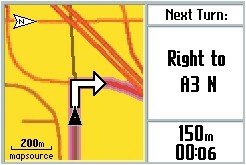 It provides navigation information outdoors, in a car, in a train or even in an airplane (see MapSource examples). Voice prompting in 11 languages (Danish, Dutch, English (UK and US), Finnish, French, German, Italian, Norwegian, Spanish and Swedish). Power cord with speaker included. Voice files are available for download from our server, see Downloads (requires firmware version V3.40 or higer). 243 MB Memory to store more detailed maps with roads, crossings and addresses of restaurants, public buildings, points of interest etc. Suited to be used as a hand held device or in any kind of vehicles. Comes with power cable with speaker, mount kit with suction cup for quick mounting and dismounting to easily remove the GPS receiver (seamless switching between cars, theft protection etc. ), does not require any installation. Automatic computing of a route to a user selected destination including up to 254 via-points. The GARMIN Quest finds routes more than twices as fast than the GARMIN StreetPilot III, see GPS Routing Speed for more information. Stores up to 500 waypoints with name (up to 30 characters), icon (choice of 85 symbols), coordinates and altitude, grouping of waypoints by user definable categories. Records the travelled route (track), stores up to 10'000 track log points. Various options to control track recording. Note: You may configure the main pages through options. The screenshots below are just examples, the actual appearance may vary from the pages shown below depending on the current settings. Especially the content of the data fields is user configurable. You can choose from 33 different values1). * These menu items are not visible on the above image. 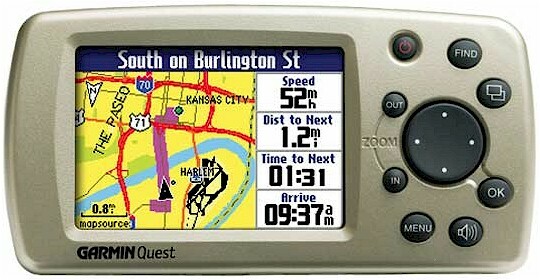 Note: The Quest/Quest 2 has no built-in compass, it can only determine the current heading when moving. Selection 1: For each data field, you can choose one from the following 33 values. 2 Arrive - Destination Estimated arrival time at the final destination. 3 Arrive - Next Estimated arrival time at the next turn. 4 Bearing The compass direction from a position to a destination measured to the nearest degree; also called an azimuth. 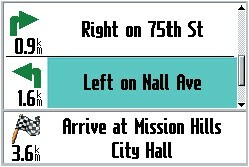 In a GPS receiver, bearing usually refers to the direction to a waypoint. 5 Course The direction from the beginning landmark of a course to its destination (measured in degrees, radians, or mils) or the direction from a route waypoint to the next waypoint in the route segment. 6 Distance - Destination Current distance to the final destination. 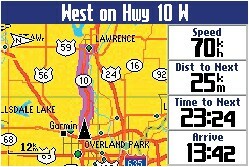 7 Distance - Next Current distance to the next waypoint or turn. 8 Elevation Current altitude above sea level. 9 Heading The direction in which you are currently moving. 10 Location (lat/lon) Current location as latitude/longitude coordinates. 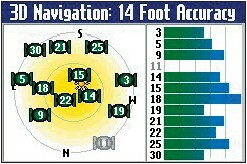 11 Location (selected) Current location indicated in the selected format (datum). 12 Name - Destination Name of the final destination. 13 Name - Next Name of the next turn. 14 Odometer Total distance travelled since last reset*). 15 Off Course The distance you are off the desired course. 16 Power Indicates the power status of the rechargeable battery (does not appear as a data field option on the trip computer page). 18 Speed - Maximum Maximum speed since last reset*). 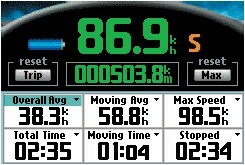 19 Speed - Moving Average Average speed without the time with no motion since the last reset*). 20 Speed - Overall Average Average speed including the time with no motion since the last reset*). 27 Trip Odometer Travelled distance since last reset*). 28 Trip Time - Moving Time with motion since last reset*). 29 Trip Time - Stopped Time without motion since last reset*). 30 Trip Time - Total Total time since last reset*). 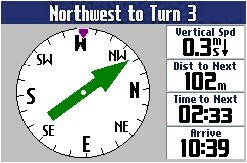 31 Turn The direction of and the distance to the next turn on a route. 32 Velocity Made Good The rate of closure to the destination, based upon your current speed and course. 33 Vertical Speed Current ascending or descending speed. These models have been discontinued; however, you can still order options for the Quest and Quest 2. 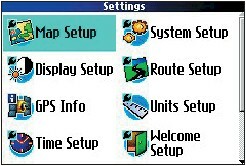 All options for the GARMIN Quest/Quest 2 in detail, find maps here.